This Isn't A "Trump Trade"
The "Trump Trade" characterization has the subliminal effect of causing you to believe (a) the increase in stock prices is tenuous and entirely predicated on one individual and his policies, and (b) it’s a result you have to be nimble enough to sell out of before stocks go down. It’s the “selection and timing” narrative the media and Wall Street so desperately want you to believe. But neither of these things are true. First, we know that there are an infinite number of variables that affect stock prices — corporate earnings, interest rates, investor risk preferences, and yes, political policies to name a few. To pin everything on just one of these inputs is a convenient narrative, but sadly mistaken. Second, if this were merely a stock market surge based on the US presidential election, wouldn't we expect to have seen US shares produce returns far greater than the rest of the world? 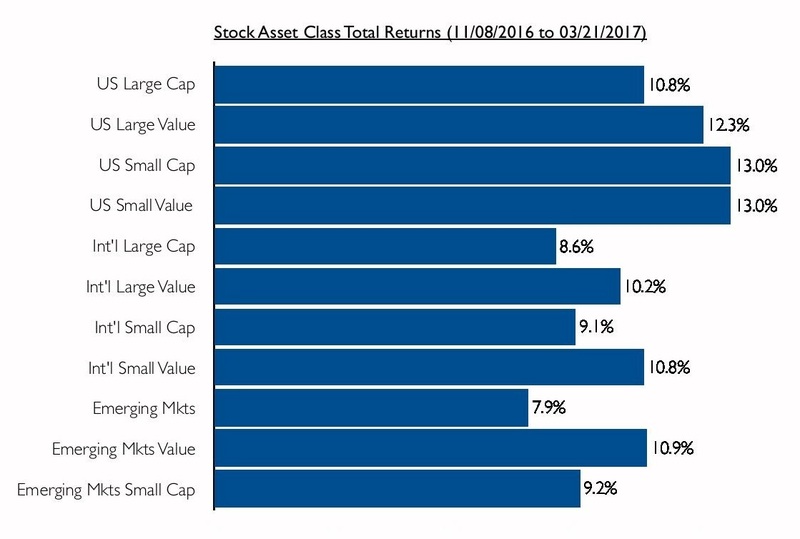 But the chart above shows that all global stock asset classes (represented by the corresponding DFA asset class mutual fund) have had similarly impressive returns. The reality is, we’ve seen a broad-based surge in global stock prices since the election, and we will eventually see a setback. But that’s completely normal for stocks and not something we can consistently predict in advance. It's not necessary to, nor should you "trade" this market. Just adopting a broadly-diversified investment portfolio that is appropriate for your long-term goals, and periodically rebalancing it will have you well positioned for whatever events happen next in markets. Importantly, you’ll trade unnecessary financial stress and anxiety with much greater confidence and peace of mind. If you would like a second opinion on your investment plan and if it is appropriate for your long-term goals, don’t hesitate to contact us. We would be happy to discuss your financial situation with you further. Past performance is not a guarantee of future results. Mutual fund returns include the reinvestment of dividends but not additional real-world costs such as advisory fees. This content is provided for information purposes only and should not be considered a recommendation or endorsement of any particular security, strategy, or service.